Three Japanese start-ups representing sectors that include artificial intelligence (AI), media and healthcare have revealed their intention to expand into the UAE, according to the Japanese External Trade Organization (Jetro). Following a successful run at the recent Gitex Future Stars 2018, the Japanese government and Jetro’s first international mission under its new J-Startup programme – media company FreakOut Holdings, healthcare app Allm Inc, and award-winning AI company Empath, confirmed plans to expand into the UAE with a view to use their new UAE base as a launchpad into the wider Middle East and North Africa (Mena) region, said a statement. 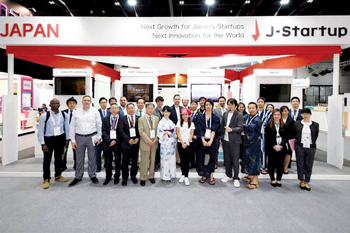 The start-ups were among 19 innovative and dynamic Japanese companies showcasing their innovative technology and services to regional audiences at Gitex Future Stars. The new development is in line with the overarching mandate of Jetro to facilitate and foster business between Japan and the rest of the world and follows the April signing of a joint statement on deepening and strengthening strategic partnerships by both Japan and the UAE, it said. It also follows Dubai being named a Global Acceleration Hub under the Japanese Ministry of Economy, Trade and Industry’s elite J-Startup programme. As a Global Acceleration Hub, Jetro’s Dubai office will support Japanese start-ups with extensive and increased access to regional professional networks and opportunities. “We are thrilled to see Japanese start-ups expand in the UAE and stronger ties between the two countries,” he added. Among the 19 innovative start-ups hosted by Jetro at Gitex Future Stars were four selected under the J-Startup programme.